Discussions regarding the founding of a college in the Province of New York began as early as 1704, at which time Colonel Lewis Morris wrote to the Society for the Propagation of the Gospel in Foreign Parts , the missionary arm of the Church of England , persuading the society that New York City was an ideal community in which to establish a college; however, not until the founding of Princeton University across the Hudson River in New Jersey did the City of New York seriously consider founding a college. 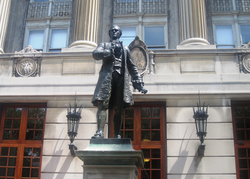 In 1746 an act was passed by the general assembly of New York to raise funds for the foundation of a new college. 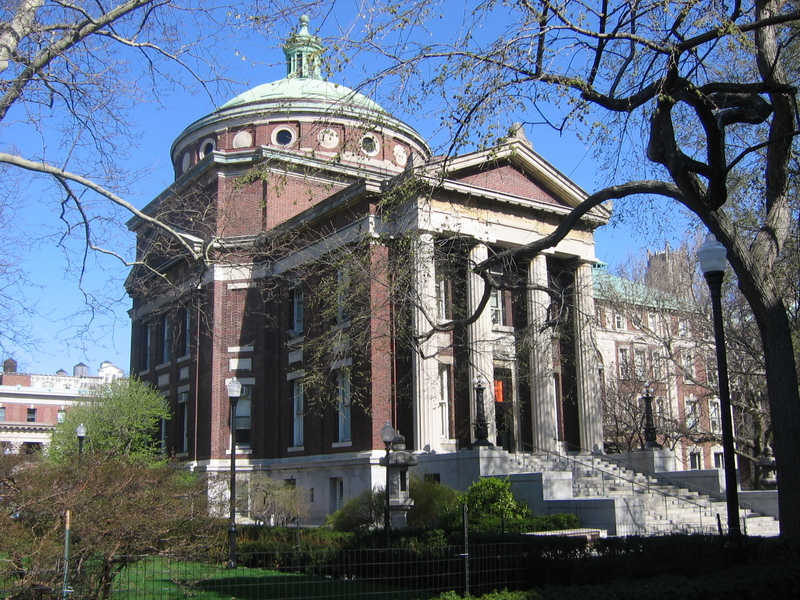 In 1751, the assembly appointed a commission of ten New York residents, seven of whom were members of the Church of England , to direct the funds accrued by the state lottery towards the foundation of a college. 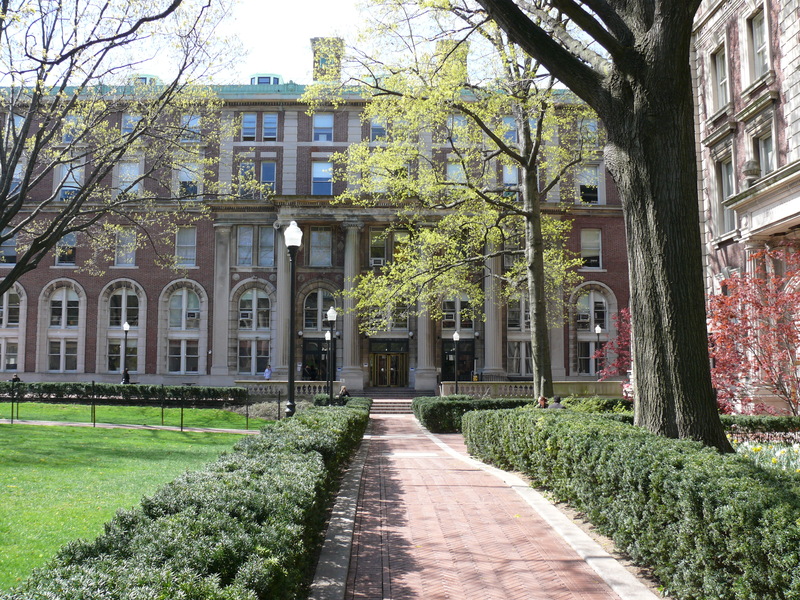 Columbia has three official undergraduate colleges: Columbia College (CC) , the liberal arts college offering the Bachelor of Arts degree, the Fu Foundation School of Engineering and Applied Science (also known as SEAS or Columbia Engineering) is the engineering and applied science school offering the Bachelor of Science degree, and The School of General Studies (GS) , the liberal arts college offering the Bachelor of Arts degree to non-traditional students undertaking full- or part-time study. 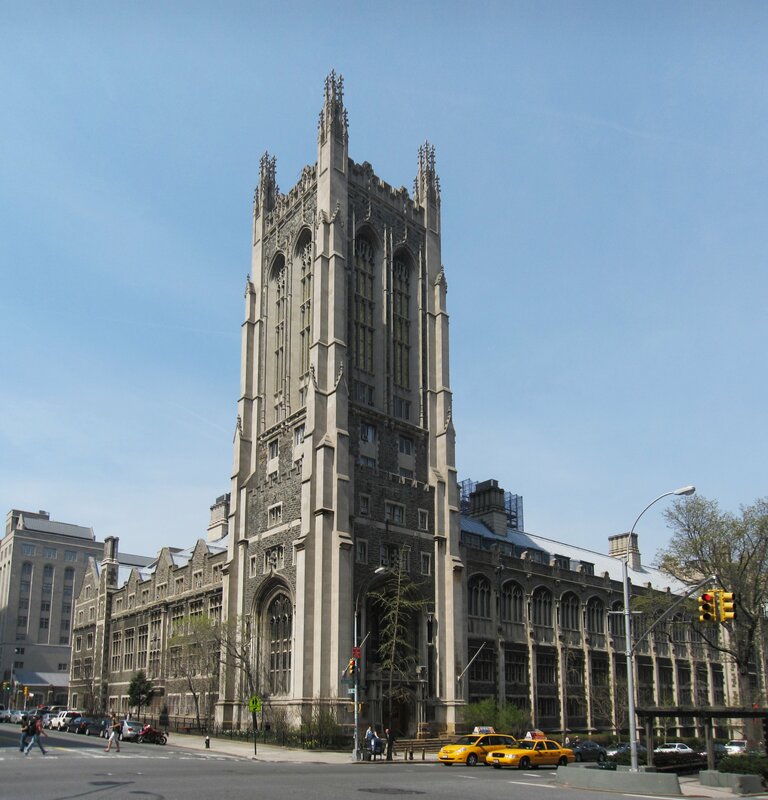 The university is affiliated with Teachers College , Barnard College , and Union Theological Seminary , all located nearby in Morningside Heights. 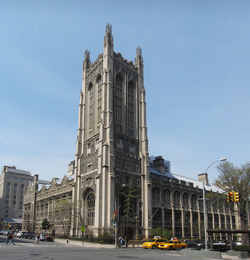 Joint undergraduate programmes are available through the Jewish Theological Seminary of America as well as through the Juilliard School . 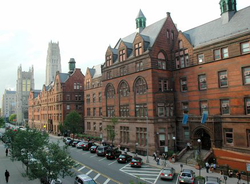 Affiliated institutions – Barnard College, Teachers College, and Union Theological Seminary – are additionally Faculties of the university. One affiliated institution—Teachers College—is likewise an academic department of the university. 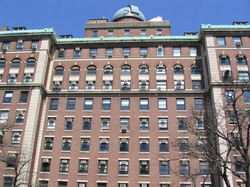 Between 1996 and 2008, 18 Columbia affiliates have won Nobel Prizes, of whom nine are faculty members while one is an adjunct senior research scientist ( Daniel Tsui ) and the additional a Global Fellow ( Kofi Annan ). 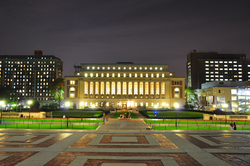 Columbia faculty awarded the Nobel Prize include Richard Axel , Martin Chalfie , Eric Kandel , Tsung-Dao Lee , Robert Mundell , Orhan Pamuk , Edmund S. Phelps , Joseph Stiglitz , and Horst L. Stormer . 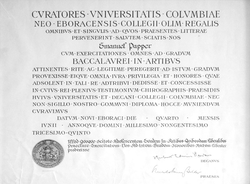 Other awards and honours won by faculty include 30 MacArthur Foundation Award winners, 4 National Medal of Science recipients, 43 National Academy of Sciences Award winners, 20 National Academy of Engineering Award winners,  38 Institute of Medicine of the National Academies Award recipients  and 143 American Academy of Arts and Sciences Award winners. 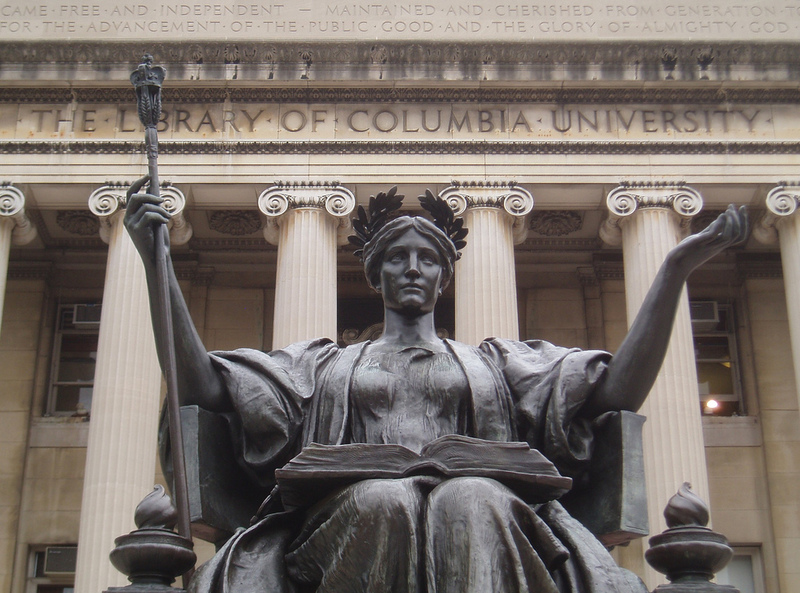 In 2015, Columbia University was ranked the first in the state by average professor salaries. 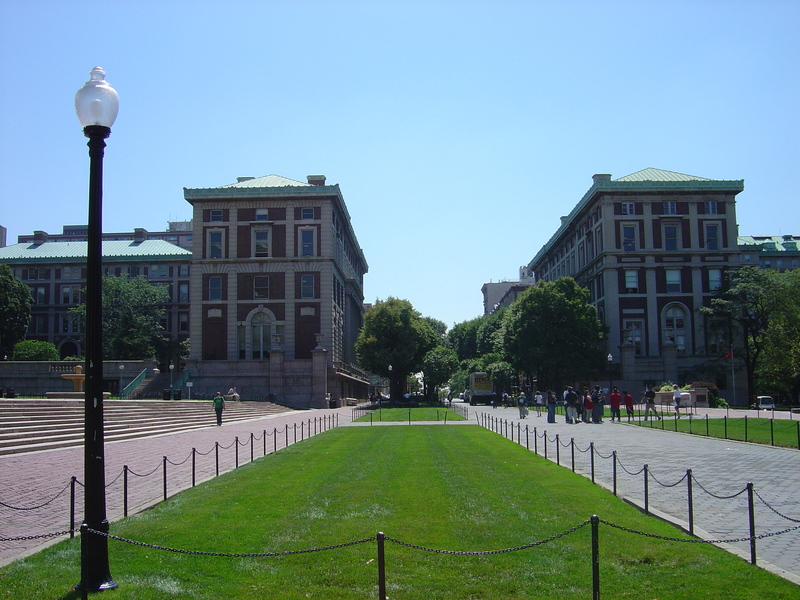 In 2011, the Mines ParisTech : Professional Ranking World Universities ranked Columbia third best university for forming CEOs in the US and twelfth worldwide. In fall 2014, Columbia University's student population was 29,870 (8,559 students in undergraduate programmes and 21,311 in postgraduate programs), with 39 percent of the student population identifying themselves as a minority and twenty-eight percent born outside of the United States. 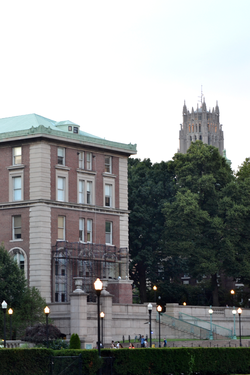 Twenty-six % of students at Columbia have family incomes below $60,000, making it one of the most socioeconomically diverse top-tier colleges. 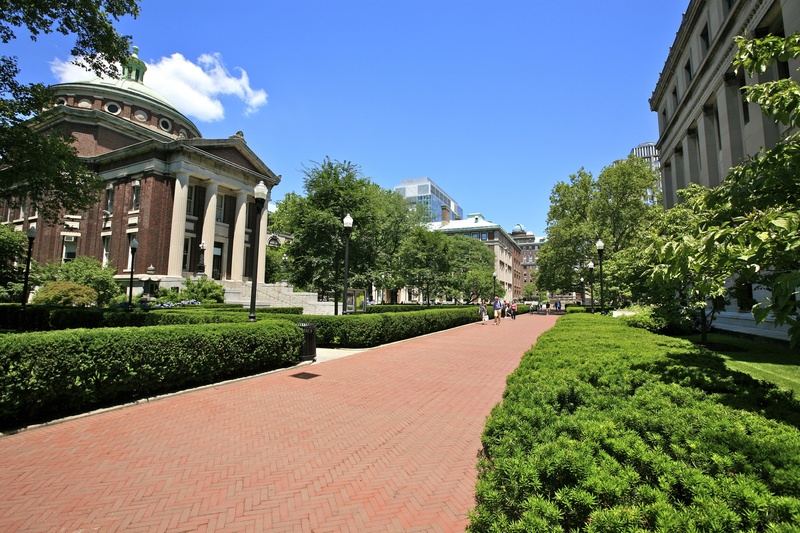 Sixteen % of students at Columbia receive Federal Pell Grants, which mostly go to students whose family incomes are below $40,000. Fifteen % of students are the first member of their family to attend a four-year college. 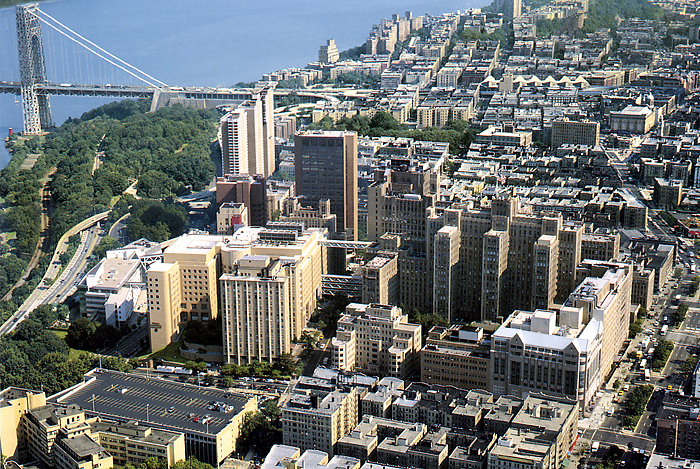 Columbia University is home to a rich diversity of undergraduate, graduate, and professional publications. 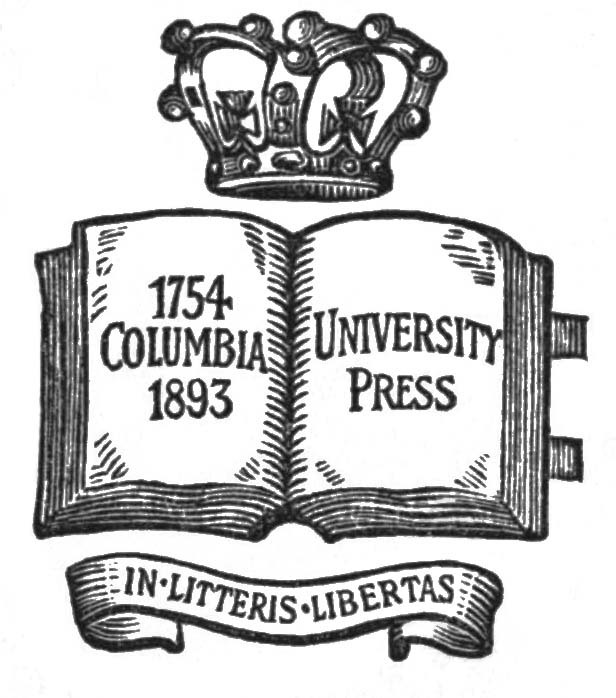 The Columbia Daily Spectator is the nation's second-oldest student newspaper;  and The Blue and White ,  a monthly literary magazine established in 1890, has recently begun to delve into campus life and local politics in print and on its daily blog, dubbed the Bwog . 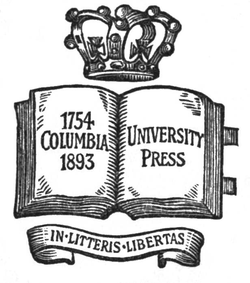 Political publications include The Current ,  a journal of politics, culture and Jewish Affairs; the Columbia Political Review ,  the multi-partisan political magazine of the Columbia Political Union; and AdHoc ,  which denotes itself as the "progressive" campus magazine and deals largely with local political issues and arts events. 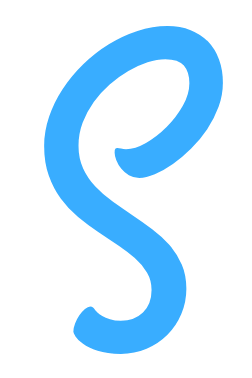 Arts and literary publications include the Columbia Review ,  the nation's oldest college literary magazine; Columbia , a nationally regarded literary journal ; the Columbia Journal of Literary Criticism ;  and The Mobius Strip ,  an online arts and literary magazine. Inside New York  is an annual guidebook to New York City, written, edited, and published by Columbia undergraduates. 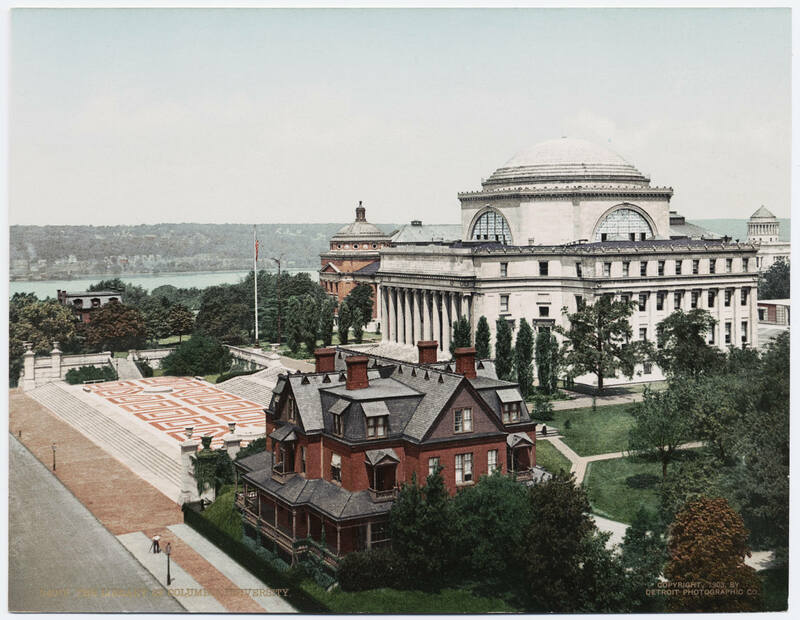 Through a distribution agreement with Columbia University Press , the book is sold at major retailers and independent bookstores. 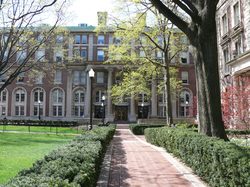 The Columbia University Organization of Rising Entrepreneurs (CORE) was founded in 1999. 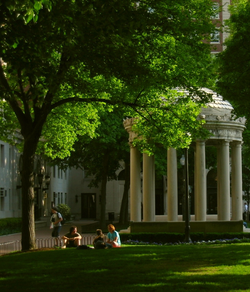 The student-run group aims to foster entrepreneurship on campus. 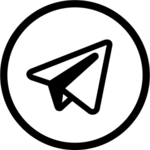 Each year CORE hosts dozens of events, including talks, #StartupColumbia, a conference and venture competition for $250,000, and Ignite@CU, a weekend for undergrads interested in design, engineering, and entrepreneurship. 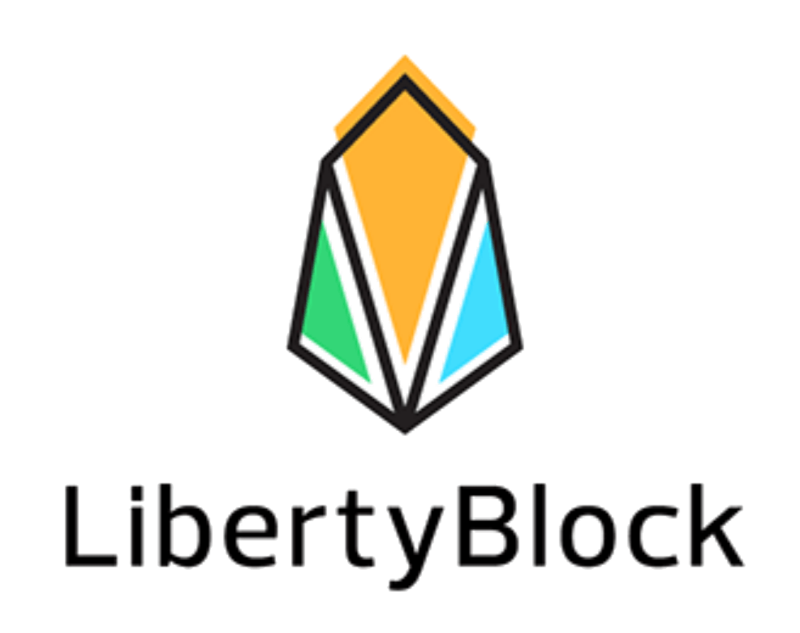 Notable speakers include Peter Thiel , Jack Dorsey ,  Alexis Ohanian , Drew Houston , and Mark Cuban . 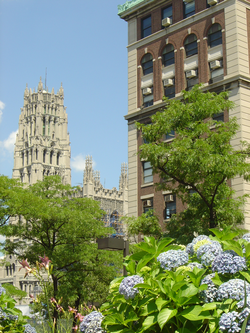 By 2006, CORE had awarded graduate and undergraduate students over $100,000 in seed capital. 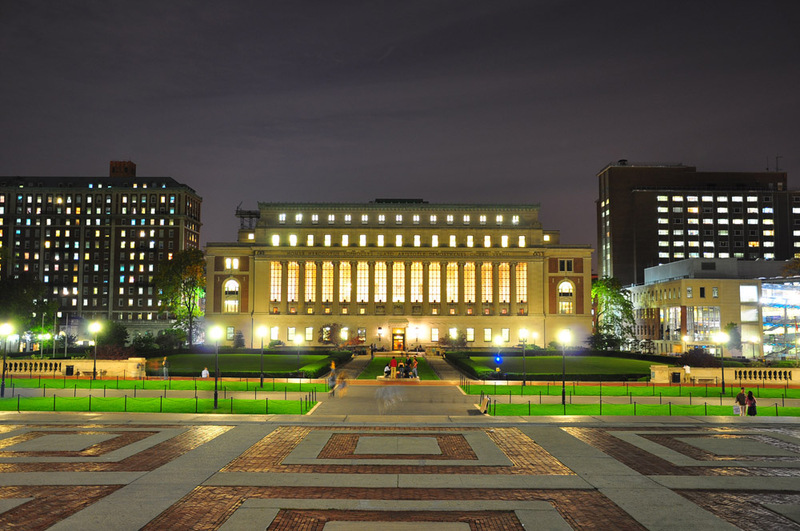 Columbia University athletics has a long history, with a large number of accomplishments in athletic fields. In 1870, Columbia played against Rutgers University in the second football game in the history of the sport. 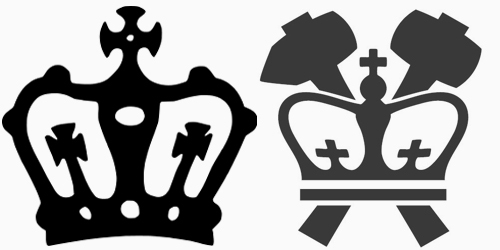 Eight years later, Columbia crew won the famed Henley Royal Regatta in the first-ever defeat for an English crew rowing in English waters. In 1900, Olympian and Columbia College student Maxie Long set the first official world record in the 400 metres with a time of 47.8 seconds. 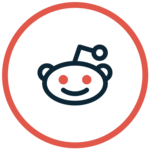 In 1983, Columbia men's soccer went 18-0 and was ranked first in the nation, but lost to Indiana 1-0 in double overtime in the NCAA championship game; nevertheless, the team went further toward the NCAA title than any Ivy League soccer team in history. The football programme unfortunately is best known for its record of futility set throughout the 1980s: between 1983 and 1988, the team lost 44 games in a row, which is still the record for the NCAA Football Championship Subdivision . The streak was broken on October 8, 1988, with a 16-13 victory over archrival Princeton University . 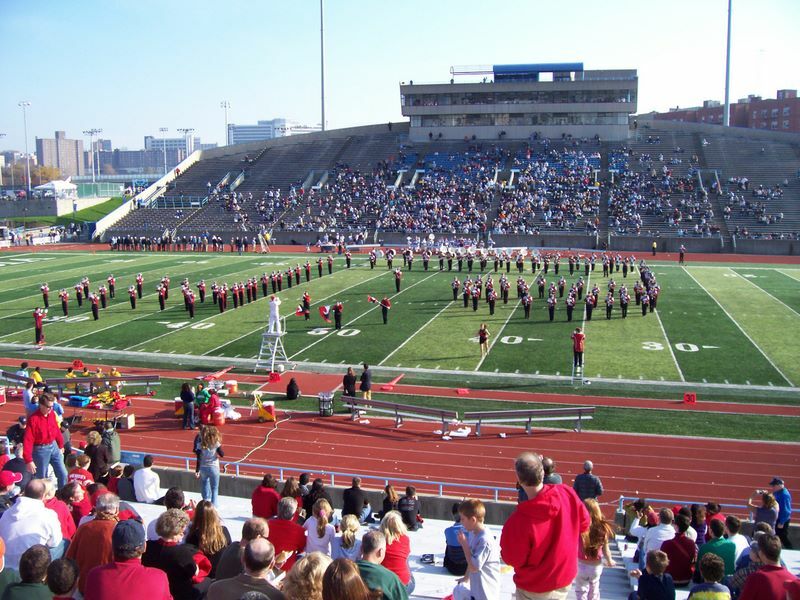 That was the Lions' first victory at Wien Stadium, which had been opened throughout the losing streak and was already four years old. A new tradition has developed with the Liberty Cup. 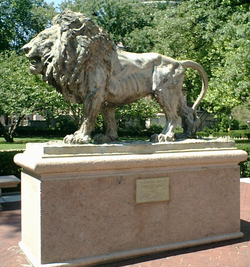 The Liberty Cup is awarded annually to the winner of the football game between Fordham and Columbia Universities, two of the only three NCAA Division I football teams in New York City. The tradition began in 2002, a year after the Fordham-Columbia game was postponed due to the September 11 attacks. 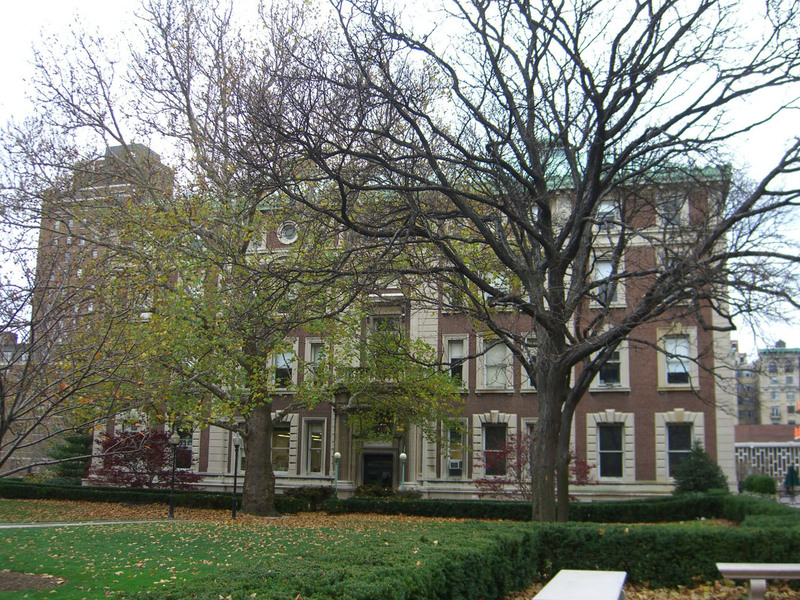 Further student protests, including hunger strike and more barricades of Hamilton Hall and the Business School  throughout the late 1970s and early 1980s, were aimed at convincing the university trustees to divest all of the university's investments in companies that were seen as active or tacit supporters of the apartheid regime in South Africa. A notable upsurge in the protests occurred in 1978, when following a celebration of the tenth anniversary of the student uprising in 1968, students marched and rallied in protest of university investments in South Africa. The Committee Against Investment in South Africa (CAISA) and numerous student groups including the Socialist Action Committee, the Black Student Organization and the Gay Students group joined together and succeeded in pressing for the first partial divestment of a U.S. university. The School of International and Public Affairs extends invitations to heads of state and heads of government who come to New York City for the opening of the fall session of the United Nations General Assembly. In 2007, Iranian President Mahmoud Ahmadinejad was one of those invited to speak on campus. 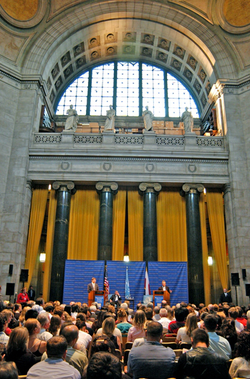 Ahmadinejad accepted his invitation and spoke on September 24, 2007, as part of Columbia University's World Leaders Forum. The invitation proved to be highly controversial. 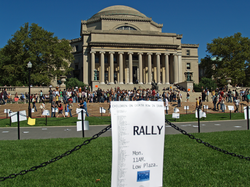 Hundreds of demonstrators swarmed the campus on September 24 and the speech itself was televised worldwide. University President Lee C. Bollinger tried to allay the controversy by letting Ahmadenijad speak, but with a negative introduction (given personally by Bollinger). This didn't mollify those who were displeased with the fact that the Iranian leader had been invited onto the campus. 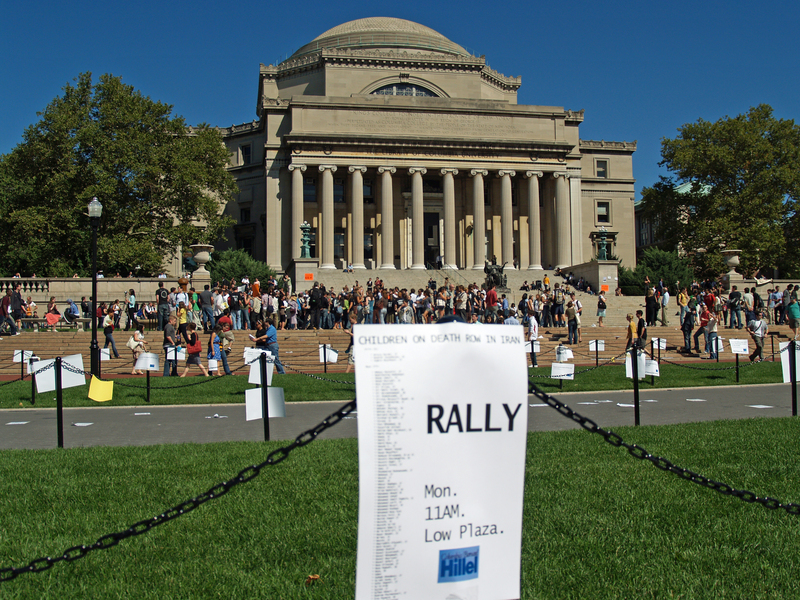 Columbia students, though, turned out en masse to listen to the speech on the South Lawn. An estimated 2,500 undergraduates and graduates came out for the historic occasion. Immediately following the College Walk festivities is one of Columbia's older holiday traditions, the lighting of the Yule Log. 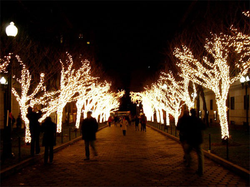 The Christmas ceremony dates to a period prior to the American Revolutionary War , but lapsed before being revived by University President Nicholas Murray Butler in the early twentieth century. A troop of students dressed as Continental Army soldiers carry the eponymous log from the sun-dial to the lounge of John Jay Hall, where it is lit amid the singing of seasonal carols. The Christmas ceremony is accompanied by a reading of A Visit From St. Nicholas by Clement Clarke Moore and Yes, Virginia, There is a Santa Claus by Francis Pharcellus Church . 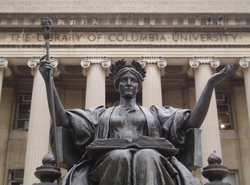 As of 2011, Columbia alumni included three United States Presidents, 26 foreign Heads of State, nine Justices of the Supreme Court of the United States (including three Chief Justices) and 39 Nobel winners . 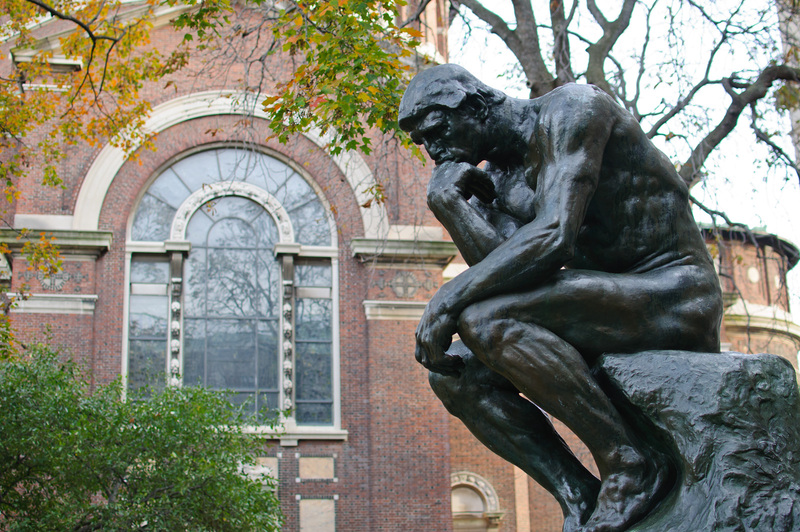 As of 2011, alumni additionally have received more than 35 National Book Awards and 123 Pulitzer Prizes . 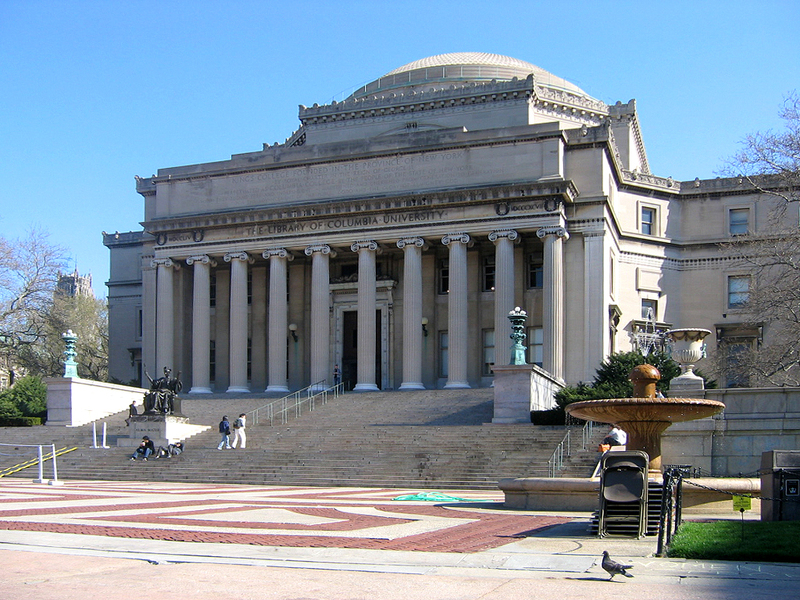 Today, two United States Senators and 16 Chief Executives of Fortune 500 companies hold Columbia degrees, as do three of the 25 richest Americans and 20 living billionaires. 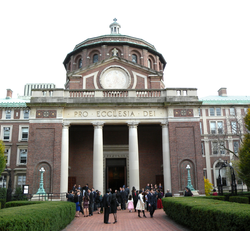 Attendees of King's College, Columbia's predecessor, included five Founding Fathers . Many Columbia alumni have gone on to renowned careers in the arts, like the composers Richard Rodgers , Oscar Hammerstein II , Lorenz Hart ,  and Art Garfunkel . 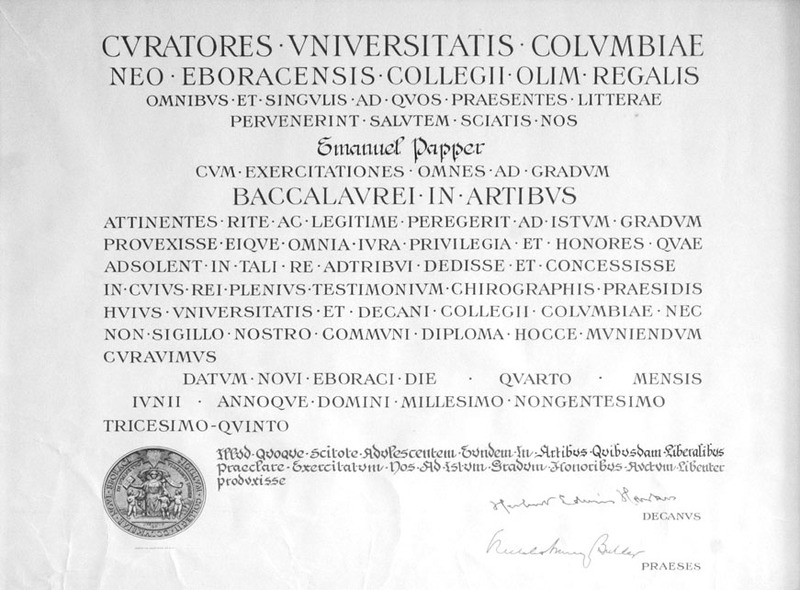 Four United States Poet Laureates received their degrees from Columbia. 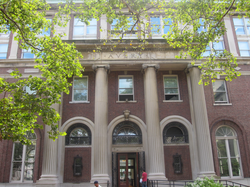 Columbia alumni have made an indelible mark in the field of American poetry and literature, with such people as Jack Kerouac and Allen Ginsberg , pioneers of the Beat Generation ,  and Langston Hughes , a seminal figure in the Harlem Renaissance ,  all having attended the university. 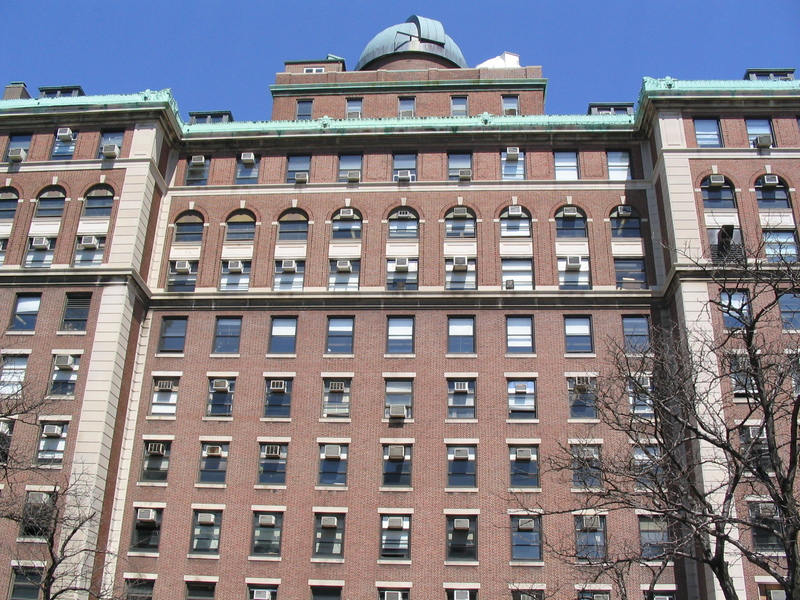 Other notable writers who attended Columbia include authors Isaac Asimov ,  J.D. Salinger , Upton Sinclair ,  and the journalist Hunter S. Thompson , primarily known for his works in the American magazine Rolling Stone . 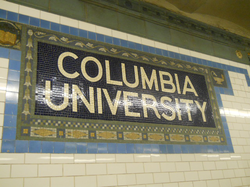 Access to Columbia is enhanced by the 116th Street – Columbia University subway station ( 1 trains) on the IRT Broadway – Seventh Avenue Line . 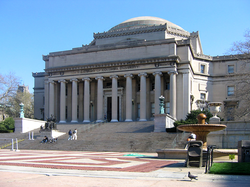 All information for Columbia University's wiki comes from the below links. Any source is valid, including Twitter, Facebook, Instagram, and LinkedIn. 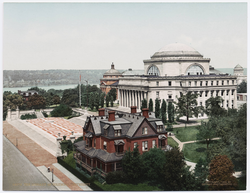 Pictures, videos, biodata, and files relating to Columbia University are also acceptable encyclopedic sources. 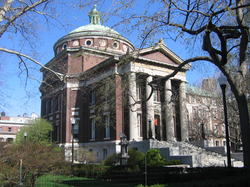 "Full-time faculty distribution by school/division, Fall 2004-Fall 2014"
"National University Rankings: Columbia University"
"School of the Arts Alumna Kathryn Bigelow Wins Major British Film Award"
"A Brief Biography of John Jay"
"Old Coal Hoppers, Columbia University"
A Columbia Marine To Obama: Help! "Full-time, part-time headcount and full-time equivalent enrollment by degree status, Fall 2014"
"TV Makes You Famous; Rock 'n Roll Makes You Rich"
"Holiday Season Ushered In With Tree-Lighting Ceremony"
"Leading American University Producers of PhDs, 1861–1900"
"Columbia Senate Supports Selling South African Stocks Selectively"
"Two Centuries of "Columbian" Constitutionalism"
"Columbia University Hamilton Society: About"
"The Waltons: Inside America's Richest Family"
"Howard Koch, a Screenwriter For 'Casablanca,' Dies at 93"
"A Brief History of Columbia"
"New York Isn't Silicon Valley, and That's Why They Like It"
"An Interview with Giuliano Amato"
"The Myth of the College Sweetheart"
"Columbia University Tuition And Costs"
"Columbia Journal of Literary Criticism"
"Columbia's Radicals of 1968 Hold a Bittersweet Reunion"
"What Is the Mace? A Guide to Columbia's Icons"
"Mayor Bloomberg launches NYC Media Lab"
"About the World Leaders Forum"
"Education: Prince with a Purpose"
"Libraries and Collections: Fast Facts"
"Edwin Armstrong: Pioneer of the Airwaves"
"The Steps at Low Library"
"Joseph L. Mankiewicz, Literate Skeptic of the Cinema, Dies at 83." 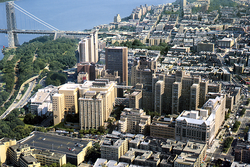 "Office of the President: Lee Bollinger"
"Columbia University Green Report Card"
"Science and Technology Ventures - Success Stories"
"Biography of Salim Ahmed Salim"
"The Varsity Show, April 15–18"
"The Alpha Delta Phi Society: About Us"
"In West Harlem Land Dispute, It's Columbia vs. Residents"
"T. V. Soong (Song Ziwen) - A Prominent Businessman and Politician in Republic of China"
"Columbia University 250: Milton Friedman"
"U.S. Students yesterday, world leaders tomorrow"
"James Cagney Is Dead at 86; Master of Pugnacious Grace"
"U.S. Air Force ROTC - College Life - College"
"Namibia PM is Nahas Angula...Educated in the US"
"World Leaders Forum: Frequently Asked Questions"
"East Asia Review: About Us"
"Columbia 250 - Columbia Nobel Laureates"
"Columbia University 250: Langston Hughes"
"No, Not a Curse But a Jersey Prize For Worst Verse"
"Fraternity and Sorority Life at Columbia"
"Business Profile: Philippe P. Dauman"
"Columbia University: About Columbia: Columbia's Nobel Laureates"
"The Biography of Marek Belka"
The biographical dictionary of women in science : pioneering lives from ancient times to the mid-20th century. "Alumnus, Author of Indian Constitution Honored." 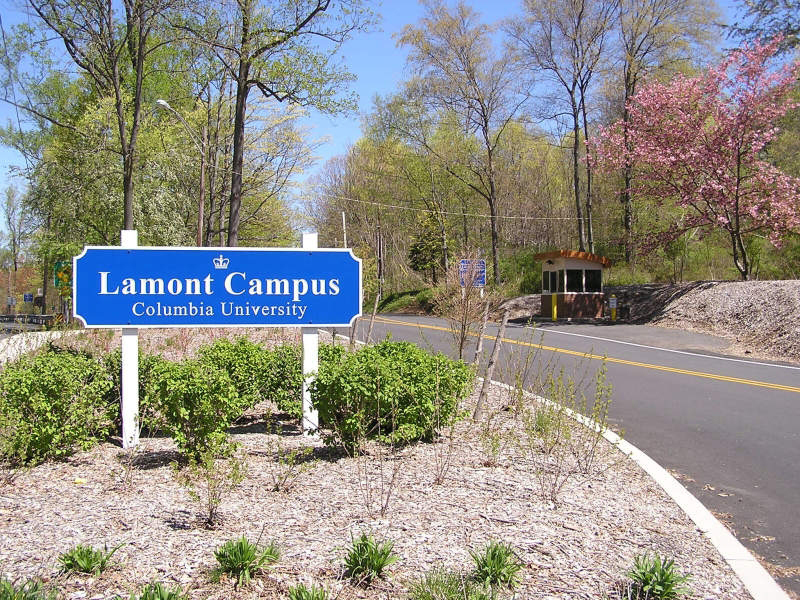 "2 Gas Stations, and a Family's Resolve, Confront Columbia Expansion Plan"
"Tribute: The Legacy of Ruth Bader Ginsburg and WRP Staff"
"Columbia University to Offer Financial Aid to More Students"
"Why They Called It the Manhattan Project"
"Columbia University 250: Isaac Asimov"
"Participants | Columbia University World Leaders Forum"
"Google Conquers China: An Interview with Kai-Fu Lee"
"President Bollinger's Statement About President Ahmadinejad's Scheduled Appearance"
"Gym Groundbreaking Will Be Held Next Month"
"Letters To The Editor; The Interesting Career Of John Jacob Astor Ii. A Man Of Broad And Generous Sympathies Who Appreciated The Responsibilities Of Wealth"
"M'ville Expansion Clears Last Major Hurdle, State Approves Eminent Domain"
"School of General Studies: History"
"Ivy League acceptance rates for the class of 2020"
"Xerox's next CEO: Ursula Burns"
"Half of N.Y. colleges pay profs less than $100K"
"CIRCA - Traveling team awards"
"Columbia, Michigan and Connecticut Among 25 Colleges to Add Common Application"
"Headcount enrollment by school, race/ethnicity, and citizenship, Fall 2014"
"Stephen Jay Gould: driven by a hunger to learn and to write". 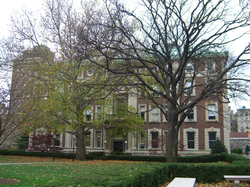 "Top 10 Journalism Schools in the U.S"
"Candidates Speak Out On Ahmadinejad Visit"
"National Register of Historic Places Inventory-Nomination: Low Memorial Library, Columbia"
"State Building Challenges in Timor Leste"
"Square's Jack Dorsey goes recruiting in NYC"
"In the Case of Robert Andrews Millikan"
"The 400 Richest Americans - Forbes.com"
"Dual LLB JD Program between Columbia University and UCL"
"Orgo Night! A Columbia University Marching Band Tradition"
"The Presidents of the United States - Biographical Sketches"
"Patents Bring in the Cash to Columbia"
"Office of the Secretary of The University"
"Dual BA Program Between Columbia University and Sciences Po"
"New Inventions / New Discoveries"
"Faculty | Columbia University Office of Undergraduate Admissions"
"Image is Heavy Burden - Weightlifter Karyn Marshall Feels Pressure to Project 'Femininity, Intelligence'"
"Iran president in NY campus row"
"The 10 Colleges With The Most Pulitzer Prize Winners="
""The Original FM": The Columbia University Radio Club"
"National Register of Historic Places Inventory-Nomination: Pupin Physics Laboratories, Columbia University--Accompanying photos"
"Interview with Eric H. Holder, Jr."
"Finding History In Radioactive Storage Rooms"
"Organization and Governance of the University"
"A Lift For Wall Street"
Other wiki pages related to Columbia University.